CashCrate Reviews - Legit or Scam? CashCrate Reviews – Legit or Scam? CashCrate is a work from home program that provides folks with a chance to make money through various companies’ promos and surveys. Similar to companies like InboxDollars you get rewarded a small fee for performing these activities. Most of the companies with this type of business model have either gone out of business or have had to pivot in how they operate. 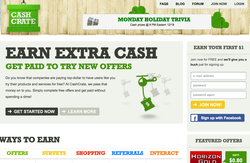 CashCrate has been around since 2006 and has accumulated 2+ million users in that time. They claim to payout thousands of dollars per month to their members, and work on providing as much transparency as they can. On their site you can find a “payment wall,” where users post their earnings from the program. They also have an active forum where you can work with other users and collaborate on the most effective methods for making money with CashCrate. CashCrate offers you 3 main ways to earn with them. You can take daily surveys, do your shopping online, and refer new members to their program. You can also play games and compete in contests for your chance to win more. Registration is free and you can get started as soon as you complete your member profile. CashCrate offers two types of surveys, the first are the daily surveys which pay $0.80 and are available twice per day. The duration of the survey may vary, with some taking a few minutes to fill out to potentially longer. You may not qualify for all the surveys since they use pre-screeners (short questionnaire) to find the exact respondents they need for their market research projects. Do not get discouraged or think that they are trying to scam free data out of you. They simply may need very specific demographics for that particular survey. You will also be eligible for Targeted Surveys – these are sent to you because you meet the criteria they need. It’s important to accurately fill out your profile to make sure you can participate in these. Targeted surveys typically pay more as well. This is one of the more controversial ways with which to make money with CashCrate. The company may send you trial offers for products or services. After you sign-up you will get credited with a payment. However it is important to read all of the terms for each offer that you join. Many times you may be asked to enter in your credit card details, if that is the case there may be a forthcoming charge after the trial period is over. They also have a referral program that pays out on two tiers. You get paid 20% of what your referrals make and 10% of what their referrals make. Members can cash out when they reach a minimum balance of $20 in their account. If you have any questions you can submit an inquiry using their online contact form www.cashcrate.com/contact. There are mixed reviews for CashCrate, some members have figured out the best ways to maximize their profits from this site while others have not been so fortunate and have difficulty qualifying for surveys. Those that do well advise that people should create a separate email account for CashCrate offers, that way you can avoid the spam and sign up for more offers and trials. Some of the other major players in this niche are Swagbucks, InboxDollars, and SendEarnings. All of whom follow a similar formula that rewards members for interacting with their advertisers. If you are a member of Cash Crate please leave a detailed review below, let others know if you were able to make money with this program or not. Average Rating for " CashCrate " is 2.86 out of 5 based on 7 reviews. I would avoid this site at all costs, in my opinion they are deceitful and misrepresenting. Of course these elaborate schemes do not deceive everyone as some people have to be paid in order to attract new members, however more bad experiences than good ones, the people running the site are rude, arrogant and the support treats you as such. The pay rate for the offers is abysmal and a complete and utter waste of time - more times than ever they will find ways and excuses to reverse / charge back what was credited, citing generic, canned replies, even if you were 100% honest, even when providing proof. A lot of the offers are also deceitful, CC may say that it is not their fault it is 3rd parties, but it is THEIR responsibility to properly screen the offers. The best advice I can give to you if you want to join CashCrate, research the type of offers you want to do, some are downright scams, of course CashCrate is not accountable for this, even though CC's themselves tend to block accounts for no reason. I have been a member of a few survey sites for about 3 years now. Cashcrate account is still at $4plus. I try to do the surveys, free offers, but get disqualified 99% of the time! It really stinks when they only pay two cents for watching a video! I tried one tonight, but it would not load up! Thank the Lord that I have a real job!! Also the only survey site that I have cashed out on--3 times--is MY SURVEY for gift cards! It's definitely legit! I got my check in the mail as promised!! This is NOT a scam! I have been a member for over a year. In order to make the most out of this site, you have to find the offers that work best for you. I make the most of my money from the bonus surveys and bonus offers. Also, in order to not get spam mail or phone calls, you must create a fake email address and also a fake phone number (which you can do through several websites). The checks do take a while to receive until you have reached 50 referrals, then you get them sooner. Cashcrate does not follow their own terms and service agreements. They state one account per person, not household. I contacted them about this, with my husband and I both having accounts and the fact that on this site (reviewopedia) I read about users being terminated after earnings. I decided before using too much of my time I would make sure their terms are what they said "per person". Glad I just went ahead and contacted them because sure enough they use the additional terms of "their discretion" to cancel legit accounts so they don't have to pay out. I offered whatever proof they wanted as to the accounts belonging to two different people, but was not contacted further and was blocked for logging into my account. I am glad it was only a few days and about $10. I was wondering about this site because it is pretty easy to come across a few dollars a day, as to where other sites take a bit longer, but pay out (like Swagbucks). I am going with unfair and unjust on this site. Also I have had a few telemarketers call me since using this site, and since a call from the aspca the next morning claiming I asked for additional information on pet insurance was too much of a coincidence, after saying no to that exact offer the night before, cashcrate is a great deduction. What is the answer?! Every other comment says it's good, every other comment says it's bad! Btw if you search "is cashcrate a scam?" you will get mostly people saying it's a scam. If you search "is cash crate legit?" you will get mostly people saying it's not. im waiting for my first check right now. but i have earned 21 dollars in three days.